The Brock Lesnar UFC comeback that the MMA and WWE worlds are talking about simultaneously today has not garnered respect from all of the mixed martial arts promotion’s fighters. In fact, there is one heavyweight who didn’t feel Dana White would match the Beast Incarnate with anyone of consequence. While talking to Adam Carolla on the Monday morning edition of The Adam Carolla Podcast, Roy Nelson — “Big Country” himself — responded to the question of whether he would be the opponent for the Brock Lesnar UFC comeback. In his response, Nelson played off the idea of a matchup, claiming that White and company would be “very careful” with whom they matched Brock. When Carolla asked him to qualify the remark by inquiring if Nelson thought the UFC was going after “an almost assured victory” for Brock, Big Country responded with a chuckle. Since that show was recorded, the Brock Lesnar UFC comeback has been made official with the name of an opponent, and the guy is anything but inconsequential. It’s none other than Mark Hunt, one of 12 men who’ve beaten Big Country throughout his career and one of only two — the other being Andrei Arlovski — to knock out the big man.
.@BrockLesnar has his opponent for #UFC200! While that leaves Nelson with some egg on his face following the Carolla interview, it isn’t necessarily a good thing for Brock. In the last three fights of his short-lived MMA career, Lesnar was anything but impressive. He was able to get the submission on an exhausted Shane Carwin, who very nearly finished Brock in the first round of their bout. That fight may have been a win for the Beast Incarnate, but it exposed the flaws in his game, and his next two opponents would take advantage with both Cain Velazquez and Alistair Overeem finishing him via TKO in the first round. While Mark Hunt’s record is not exactly stellar at 12-10-1, he’s riding a two-fight winning streak with victories over Nelson, Antonio Silva, and Frank Mir. His two losses were to the current UFC Heavyweight Champion Stipe Miocic and the guy Miocic took the strap from, Fabricio Werdum. Both losses came by way of TKO — Round 5 against Miocic and Round 2 against Werdum. Translation: It’s an interesting matchup, but not one with real title contention implications considering Hunt is at the back of the line for the belt, and the WWE has gone on the record saying Brock’s fight will be a “one-off” to commemorate UFC 200 on July 9 and that he will be back in a WWE ring for SummerSlam in August. At this point, Brock’s tough guy credentials are firmly in place at his day job. While a loss to Hunt — even a quick one — could tarnish the invincible image he’s worked hard to rekindle since rejoining WWE, it is also widely acknowledged among WWE Superstars that he isn’t a guy any of them would want to tangle with in a fight. Wrestling fans also “get it” that their sports entertainment isn’t an actual competition and that the UFC is a different beast entirely, so don’t look for Lesnar to come out of UFC 200, win or lose, with any black marks on his gimmick. 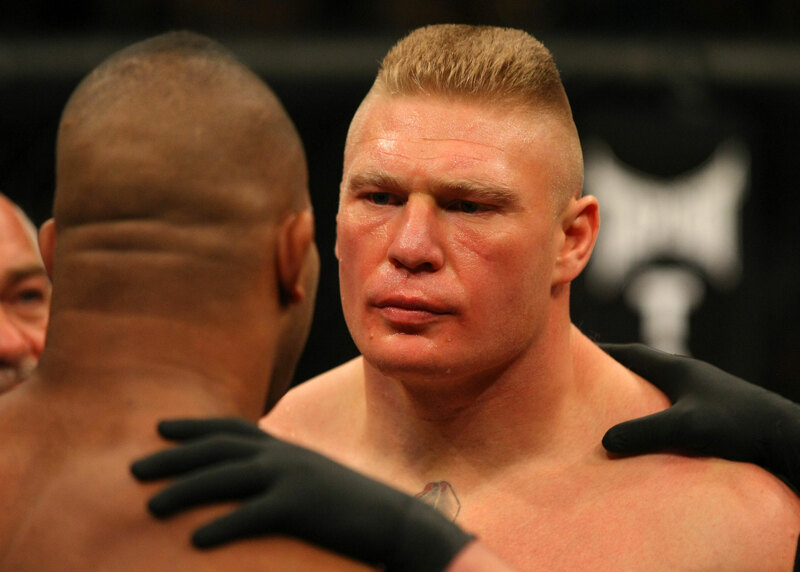 Could the fight at UFC 200 hurt the Beast with WWE, and do you think Nelson was disrespecting the Brock Lesnar UFC comeback with his comments?